The below method i am going to share with you will not only tell how to increase your facebook Fanpage likes But also Increase your Twitter , GooglePlus , StumbleUpon , YouTube and MySpace Followers.Remember the below procedure is legal to increase the facebook fan page likes and so i would recommend this method .You cannot increase your facebook fan page likes over a night Using this method But i assure you would get around 200 likes a day if you spend few minutes per day. Also read : 5 latest facebook tricks you might not know. I have given two methods That can double your likes and shares.Follow both the method . Note : This article has been updated thrice. So continue till the end to see the latest updates and methods. Sign up an account there and login. You can get this 50 points for every24 hour. NOTE: The first time you login you need to wait for a day to get this points. Update:Now they provide points only if you like 5 facebook pages of other people ! 6. Login with your facebook profile first , then add your facebook fan page Link. 8.The more the points you give away , the more preferences will be given to your page.I would recommend to set 4 points which can get a reasonable number of likes per day. 9.You can also earn points by liking other people pages in facebook in YouLikeHits. The Above procedure mentioned is same for all other websites like Twitter , GooglePlus , StumbleUpon , YouTube and MySpace . Use the below method also and get your likes and shares doubled. You can get this 100 points for every24 hour. 5.You can add your facebook or anyother page by clicking the link mentioned above in the picture. 7.The more the points you give away , the more preferences will be given to your page.I would recommend to set 8 points which can get a reasonable number of likes per day. 8.You can also earn points by liking other people pages in facebook in ADDMEFAST. 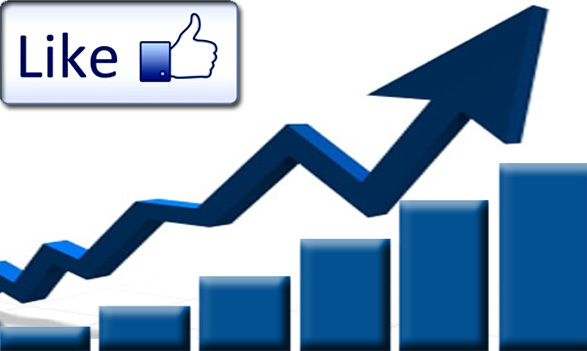 As i am still receiving a lot of traffic to this post i’m going to explain you few more genuine ways to increase Facebook fan page likes. Create a Facebook like box widget and share it on your website.For creating those widgets you can refer good websites like “mybloggertricks”.That website has lot of attractive like boxes and choose the best one that fits your blog.Adjust the colors so that it merges with your blog and doesn’t look odd. Recommend people to like your facebook page at the very end of every article so that when a person likes your post will surely like the page for getting more updates on his facebook notification. Force people to like your Facebook page.This can be done by displaying only the like box when someone visits your blog.Only after liking the page he/she can enter the page.This makes the page annoying but works good sometimes. Create download links for your products and allow people to download the product only if they like your Facebook fan page. 2.Keep a eye-catchy profile picture and timeline picture for the page. (works 100% everytime). 3.Try to share fun articles on your page because when people see entertainment, jokes or funny images the chances of likes and share are more and so it would reach to more number of people. Share the post if you have liked it ! This entry was posted in facebook on Jun 25, 2014 by Rajesh. One such update is the website URL spam prevention which is very common nowadays with the users. But even many innocent website’s gets affected too because of this update and if you think your website is legitimate and still getting the blacklisted by Facebook then this article will be very helpful for you to beat around the bush. When Facebook’s algorithm finds that a website is a spam then it will start to display Captcha for that website when someone is sharing that particular link. 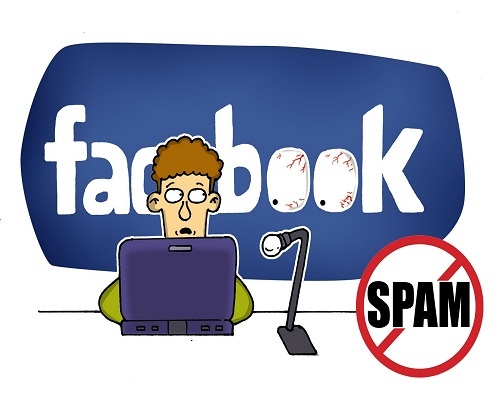 Why your Website is Considered as Spam by Facebook ? Facebook spams a site for many reason and the most common reasons for a website to get blacklisted as a spam by FB are given below. 1. You are sharing too many links of your site on Facebook groups and Pages. 2. The site your shared contains adult contents which made Facebook users to report the site. 3. You share the same link repeatedly again and again and there are no other shares happening for that link. 4. You are scheduling the same post in more than 5 different pages and groups to be shared at the same time. 5. A bunch of people had marked your site for performing scam activities. Facebook’s TOS that should be Noted before sharing a website link on your wall or page or a group. 1. You are not supposed to share a website link that downloads something when clicked on it. 2. Websites which has pop-ups directly on their landing page should not be shared on FB. Additional Tips : How to Find Fake Profile in Facebook. What to Do When Facebook Marks your Website as Spam ? There are certain measures which you must need to take care when you find that Facebook is marking your site as spam. 1. Go to the link here where you can claim to Facebook that your website is a genuine one and has been mistakenly considered as a spam. Once you click on the link you will have to fill the “Website URL” which is being considered as spam by Facebook. Select the option to which exactly the link you are sharing leads to. Enter an brief description for why you are thinking that the link you share might have been considered as a spam by FB and give them the reason why it’s actually not. 2. Facebook has a tie up with the third party extension called as “Web Of Trust“. When someone finds your website as a poor quality and if they have installed this extension on their system then they will mark your site’s quality as poor. When this is repeated by several users worldwide then Facebook spam team comes into action while you are sharing your bad quality website. So what you have to do is ask your friends to Install the “WOT“ extension on their browser and ask them to support your website by rating your website in green. How to Share Website Link Even-though Facebook Considers it as Spam ? If you find that your website is not against the TOS and the link you are sharing are genuine then there must be something wrong with the Facebook’s side only.So tricking them would not be considered as wrong because they have a poor algorithm to detect whether a website is spam or not. Go to the URL shortening website such as bit.ly and hide you website’s link behind the shortened link. In bit.ly you can simple paste the URL you want to share on Facebook and click on the “Shorten” button. 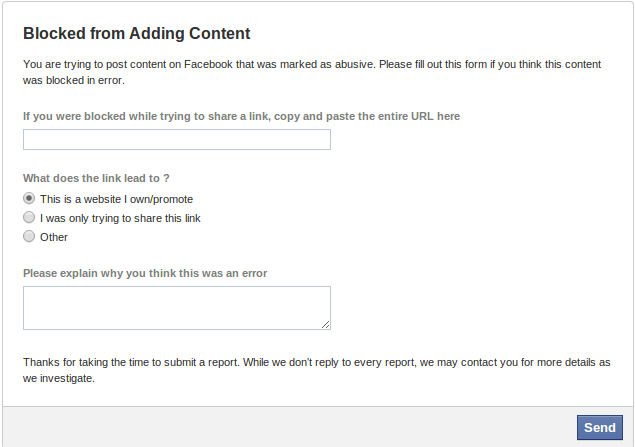 Now share the shortened link on Facebook and that must manipulate Facebook from considering it as a spam link. If you find that FB is blocking the shortening service then try using the other free URL shortening websites. This entry was posted in facebook on Apr 10, 2014 by Rajesh.